EDVTS is a simulation of the response of a vehicle-trailer system (either a tractor-trailer or automobile-trailer combination) to driver throttle, braking and steering inputs. It is based on a program called TBSTT developed by the University of Michigan Transportation Research Institute and includes extensions and refinements of the calculation procedures developed by Engineering Dynamics Corporation. As a simulation, the user provides a set of initial conditions and a table of driver inputs. 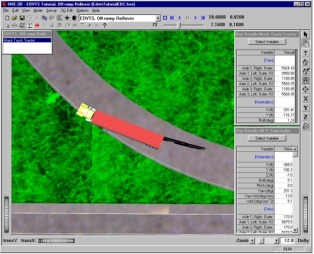 EDVTS determines how the vehicle and trailer respond to the inputs by generating the path, velocity, acceleration, tire forces and other vehicle-trailer data as a function of time. The path of the vehicle-trailer is also visually displayed on a scaled crash site diagram. EDVTS is a 4-degree of freedom (yaw plane) analysis; suspension jounce/rebound is ignored. Suspension effects are modeled using the tow vehicles roll couple distribution. Longitudinal and lateral load transfers are calculated on a quasi-static basis. The program is particularly well suited to low-to-moderate friction regimes. It also serves as an excellent first order approximation for higher friction road surfaces. Accident investigators can use EDVTS to determine how a driver may have lost control of the vehicle-trailer combination. Through repeated adjustments of the throttle, braking and/or steering inputs the user will converge on those driver inputs that match crash site evidence. It can also be used to study the effects of changes in vehicle weight distribution, wheelbase, track width, CG height, king pin location, trailer loading, single vs. tandem axle applications, tire friction, cornering stiffness and other parameters. EDVTS has been extended and refined since its introduction in 1984. The program has a history of successful application in many types of vehicle dynamics problems. Validation studies are published in the technical literature. Selectable from HVE-2Ds built-in databases, according to Type (Passenger Car, Pickup, Sport-Utility, Van, Truck, Trailer, Dolly), Make, Model, Year, Body Style. Simulation Controls (integration timesteps, convergence criterion, termination velocities, maximum simulation time, output time interval). Payload Data (location, weight, yaw inertia). Driver Data (steering wheel angle vs. time). Connection Data (inter-vehicle connection forces and moments vs. time). Visualization of vehicle-trailer motion on the crash site diagram at user-specified time intervals. Accident History (initial and final/rest positions and velocities). Vehicle Data (dimensions, inertias, tire properties).